HEK-Blue™-hTLR7 cells were obtained by co-transfection of the human TLR7 gene and an inducible SEAP (secreted embryonic alkaline phosphatase) reporter gene into HEK293 cells. The SEAP reporter gene is placed under the control of the IFN-β minimal promoter fused to five NF-κB and AP-1-binding sites. Stimulation with a TLR7 ligand activates NF-κB and AP-1 which induces the production of SEAP. Levels of SEAP can be easily determined with HEK-Blue™ Detection, a cell culture medium that allows for real-time detection of SEAP. The parental cell line of HEK-Blue™ hTLR7 cells is HEK-Blue™ Null1-k cells. 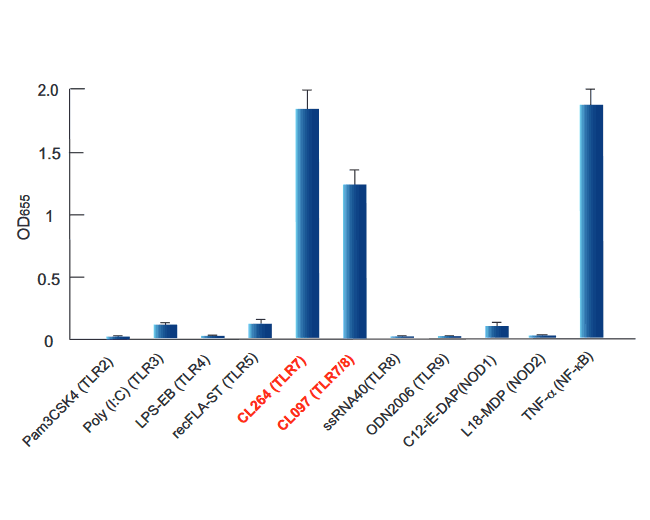 HEK-Blue™ hTLR7 cells were stimulated with various TLR and NOD agonists: Pam3CSK4 (100 ng/ml), Poly(I:C) (50 ng/ml), LPS-EB ultrapure (100 ng/ml), recombinant flagellin from S. typhimurium (10 ng/ml), CL264 (1 µg/ml), CL097 (1 µg/ml), ssRNA40/LyoVec™ (5 µg/ml), ODN 2006 (10 µg/ml), C12-iE-DAP (100 ng/ml), L18-MDP (100 ng/ml), and TNF-α (100 ng/ml). After 18h incubation (24h incubation for CL264, C12-iE-DAP and L18-MDP ligands), NF-κB-induced SEAP activity was assessed using QUANTI-Blue™ and reading the OD at 655 nm. HEK-Blue™ hTLR7 and HEK-Blue™ Null1-k (control) cells were incubated in HEK-Blue™ Detection medium and stimulated with CL264 (TLR7), R848 (TLR7/8), Gardiquimod™ (TLR7), CL097 (TLR7/8), Imiquimod (TLR7), or CL075 (TLR7/8). All agonists were used at a concentration of 1 µg/ml. After 24h incubation, the levels of NF-κB-induced SEAP were determined by reading the OD at 655 nm. HEK-Blue™ hTLR7 cells were incubated in HEK-Blue™ Detection medium and stimulated with increasing concentrations of TLR7 and TLR7/8 agonists. After 24h incubation, the levels of NF-κB-induced SEAP were determined by reading the OD at 655 nm. The response ratio was calculated by dividing the OD at 655 nm for the treated cells by the OD at 655 nm for the untreated cells. Growth medium: DMEM, 4.5 g/l glucose, 2 mM L-glutamine, 10% (v/v) fetal bovine serum, 100 U/ml penicillin, 100 μg/ml streptomycin, 100 μg/ml Normocin™. Inactivated or damaged? Comparing the effect of inactivation methods on influenza virions to optimize vaccine production. Antigens reversibly conjugated to a polymeric glyco-adjuvant induce protective humoral and cellular immunity. Impact of polymer-TLR-7/8 agonist (adjuvant) morphology on the potency and mechanism of CD8 T cell induction. Polymeric nanoparticles encapsulating novel TLR7/8 agonists as immunostimulatory adjuvants for enhanced cancer immunotherapy. Small-Molecule TLR8 Antagonists via Structure-Based Rational Design. Toll-like receptor mediated activation is possibly involved in immunoregulating properties of cow's milk hydrolysates. 2016 Nucleic Acid Ther. 26(3):173-82. 2'Fluoro Modification Differentially Modulates the Ability of RNAs to Activate Pattern Recognition Receptors. 6-(4-Amino-2-butyl-imidazoquinolyl)-norleucine: Toll-like receptor 7 and 8 agonist amino acid for self-adjuvanting peptide vaccine. Detection of innate immune response modulating impurities in therapeutic proteins. Haile LA, Puig M, Kelley-Baker L, Verthelyi D.